Slay Like a Mother reveals the good, the bad, and the ugly behind the self-sabotaging battles within all moms. This empowering self-help book champions the kind of self-doubting that mother Katherine Wintsch, CEO of The Mom Complex, calls “Never-Enough,” the kind of mother whose guilt, desperation, and fear about not being or doing enough is overwhelming. 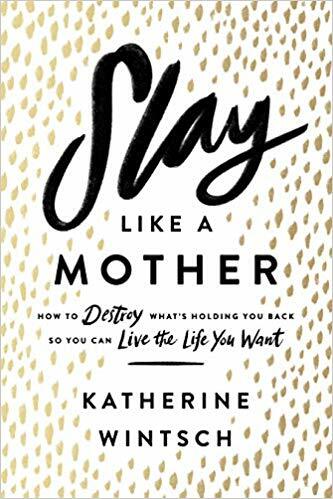 Based on more than a decade of research, Slay Like a Mother reveals the good, the bad, and the ugly behind the self-sabotaging battles within all moms. Brave, supportive and insightful, the stories and advice shared in this book will encourage women to live more confidently, enjoy the present, and slay like a mother. Have you ever felt like you keep failing as a Mother, daughter, sister, wife, friend and person? Do you compare yourself to others? Feel constantly drained but continue to take on more in your quest to be the perfect Mom? This book is for you! On the outside I like to appear as if I have everything in control, my kids get to school on time, they participate in competitive soccer, I have completed two diplomas after my Bachelor degree while working full time, I volunteer at our local soccer club and life is perfect right? Under all of that, I suffer from severe anxiety and feelings of being unworthy, unloved and never enough. I criticize myself constantly for making mistakes or for forgetting something. I take on more work then I can complete, get mad at myself for doing so and stress myself out to complete everything. As I am typing this, I almost signed up for two more Human Resource courses this term but decided against this as I just don’t have the time. This is me – I would never speak to anyone else the way I speak to me but I don’t hesitate to tell myself how awful I am, how forgetful, how I have gained weight, always late, not smart enough and the list goes on and on. I worked my way slowly through this novel as I wanted to take in every word and practice each suggestion. I found myself over and over in the other women in this story and it was comforting to know I was not alone. By the time I got to the last page, I felt empowered to make changes, to recognize when I start down the wrong path and how to make changes. Not signing up for those courses this morning was a huge challenge for me, I want that Human Resource Diploma but this would mean sacrificing the little time I have to myself and overstretching myself which not only affects me but my family to. This book is a welcome eye opener. You laugh, you cry and you can relate to the stories shared throughout the book. I felt humbled and full of hope by the end. That while I am my own worst enemy, I can get better, I can be a good Mother, wife and person. I can learn to be happy and to support others in their journey as well. This book was easy to read and Katherine is personal, funny and down to earth. While it is a book, you feel like she is right there with you, helping you through the exercises. This would be a great gift for any Mother regardless how many children she has. A definite must read! KATHERINE WINTSCH is an internationally recognized expert on the topic of modern motherhood. The majority of her expertise comes from studying the passion and pain points of mothers around the world—the rest is accumulated from a little trial and a whole lot of error while raising her own two children with her husband in Richmond, Virginia. As the founder and CEO of The Mom Complex, Katherine and her team help develop innovative new products, services, and marketing strategies for the world’s largest mom-focused brands including Walmart, Babyganics, Pinterest, Kimberly Clark, and the Discovery Network. Katherine’s sought-after research and expertise have been featured by Today, the New York Times, the Wall Street Journal, and Fast Company, and she regularly writes about the topic of motherhood on her popular blog, In All Honesty, and for Working Mother magazine. When she’s not helping other mothers find inner peace, you can find her sitting in the bleachers at swim meets, balancing upside down on a yoga mat, binging on Netflix with her husband, or sipping wine with her girlfriends. A book that is full of hope is exactly what we need! Sounds like a good read. Oh gosh, this speaks to my soul. I always feel like I’m failing. We do the best we can! Wow, this sounds like a great read. I am all about books that both empower and educate. I for sure need to read this! I feel like I am failing all the time! This is a very interesting book. I believe that a lot of moms would be able to relate to this. I have quite a few friends who feel that they have failed as a mom. Thank you for sharing this. I just shared this info with them too.